New European labels never seen before in this part of the world are arriving at Red Nest! 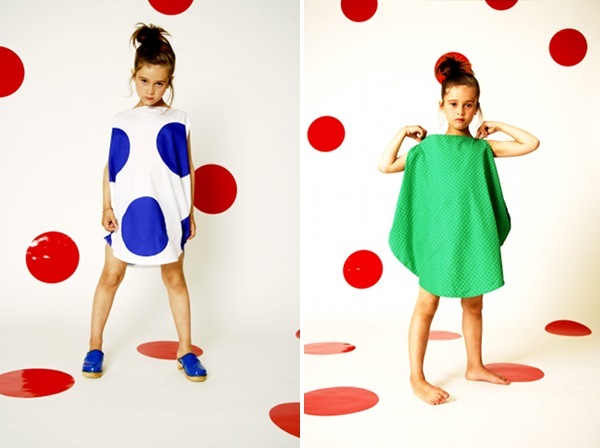 This progressive kids’ fashion boutique keeps coming up with the goods and we have the heads up on French label BOdeBO which will be in store from September. Minimalist, functional and ultimately stylish, BOdeBO has a distinctly playful bent for active kids who like to look good. The collection displays architectural genius in the fall of the garments which allow full movement. The blue and white Loro dress (above left) is also available in green (above right), with the Caro dress shown in black below next to the pink Pola dress. This collection makes me want to be a little girl all over again – it’s girly without being prissy, twirly without being frilly. We love the Topo top and pants (below) for their flowy and totally cool structure. Buy from Red Nest from September. Liking those gorgeous clogs? Well, we have another exclusive coming up about those so stay tuned!